Be aware that there is a charge of $40 for 24 hour parking but you can take your car in and out whenever you want. The rooms are fine and you can get a comfortable king size bed if you request it. 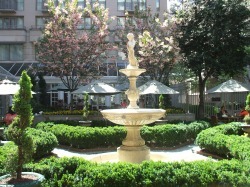 The outdoor dining area is beautifully spacious with fountain and cherry blossom trees. 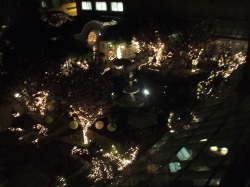 It is lit up at night, providing a warm and magical atmosphere. If you are thinking of planning a wedding in the future, think about planning one during the Cherry Blossom time at the Dalhgren Chapel of the Sacred Heart in Georgetown University – 37 and O Streets Northwest. 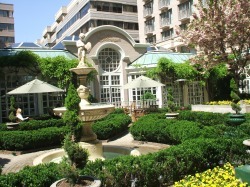 As an alternative, you can also plan your wedding right at the hotel Fairmont or for a large reception, at the nearby Four Seasons Hotel, which is within walking distance. 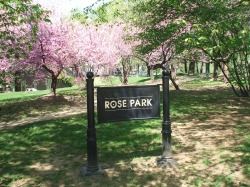 On your way, you can stroll through Rose Park. Make sure to ask each hotel for their reception rates.